Rover.com has raised more than $300M and registered more than 100,000 pet sitters. Back in 2011, the Seattle-based venture capitalist had a terrible experience boarding his dog at a local kennel. He was determined to create a better way for pet parents to find quality care for their animals, and Techstars Startup Weekend Seattle gave him the perfect opportunity to test his idea and meet team members who shared his passion. Being authentic and personal when you’re pitching someone a problem and a solution is far more compelling than when you pitch an idea that isn’t authentic to you. Though Greg didn’t know it at the time, that one weekend would serve as the launchpad for what is now a doggy-daycare juggernaut, which has raised over $300M and registered more than 100,000 pet sitters. On day one of Techstars Startup Weekend Seattle 2011, Greg gave a one-minute pitch, explaining his idea — to create a customer-centric company that serves as matchmaker between pet parents and dog sitters, walkers and caregivers. His relatable, authentic pitch scored him a diverse, super-smart 10-person team. That team got to work, striving to build a company in just 54 hours. Over three days, they experienced the highs, lows, fun, and pressure that make up life at a startup: learning from local mentors, finding customers, building the product, and finally presenting the brand new company to a panel of local startup leaders — who awarded Rover first place! 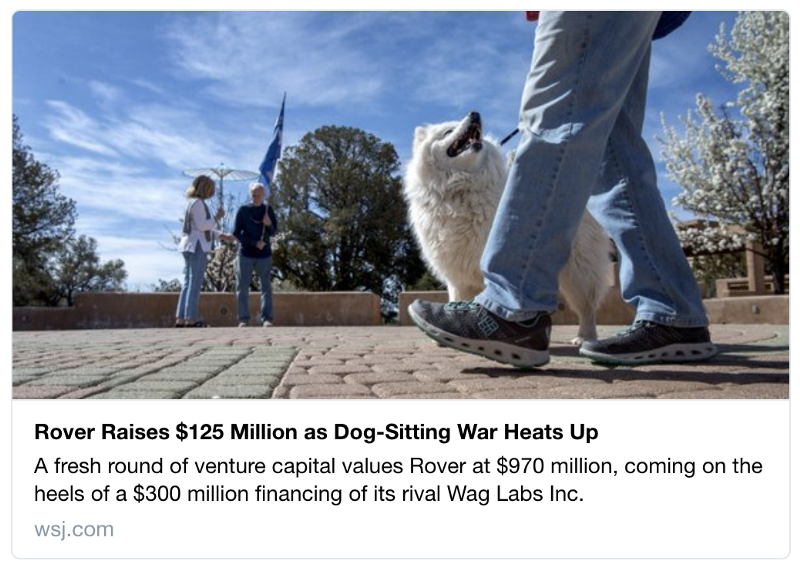 Since then, Rover.com has raised more than $300M and registered more than 100,000 pet sitters. In March 2017, Rover acquired DogVacay, joining forces to create dominance in the online dog care market. Earlier this year, Rover.com announced a round of $125M in equity funding, and an additional $30M in debt to continue their aggressive growth trajectory. Greg has made a career out of starting up. He currently serves as managing director for a startup studio called Pioneer Square Labs in Seattle, where he and his team create companies from scratch. For 20 years he served as managing director at Madrona Venture Group, the largest venture capital firm in the Pacific Northwest. For the past 15 years, he has taught entrepreneurship and computer science at the University of Washington. We recently caught up with Greg to get the back story on Rover.com. We asked him to share his top tips for anyone considering attending a Techstars Startup Weekend in their area. “During the one-minute pitch, I told a personal story about my own dog and that was compelling to people. Being authentic and personal when you’re pitching someone a problem and a solution is far more compelling than when you pitch an idea — even if it’s a great idea — that isn’t authentic to you. One team member who signed on to Rover.com for Techstars Startup Weekend was Phil Kimmey, a developer and (at the time) rising senior at Washington University. Over the weekend, Greg realized that Phil was an exceptionally talented young engineer, who also didn’t have a summer job lined up. Today, Greg says, “Had Phil Kimmey had a summer job, had someone realized how talented he was, there would be no Rover.com.” Phil became a co-founder, and is still a member of the leadership team. The roots of Rover’s culture are entrepreneurial and customer focused, which is a culture that is grounded in Techstars Startup Weekend. At Techstars Startup Weekend, finding and focusing on the customer, not just the product, is an important part of the weekend and learnings. “I think a lot of times what happens is that people get very sensitive about equity splits and those kinds of things. When in reality, as you think of the many thousands of businesses that have been started at Startup Weekend, I bet there would be a larger number of companies that were successful if people weren’t as sensitive about the equity splits. Techstars Startup Weekend has hosted over 5,800 events in more than 150 countries, with over 330,000 alumni. At these events you’ll be immersed in the ideal environment to learn, build, and meet your next team. Startup Weekend is an incredible, intense, addicting experience. For those who haven’t tried one yet, you should sign up for the next one. Find a Techstars Startup Weekend near you.